29 ingenious routines from over 20 years of published work, all rewritten, revised, updated and upgraded. Plus 3 brand new miracles, including David's astonishing moving-hole effect, "Wormhole"! Produce the sound of a cellphone ringing out of thin air before producing the cellphone itself! Punch a hole in your business card, then slide it off and place it on the side of a take-out coffee cup, causing coffee to suddenly begin streaming out! Magically link a borrowed finger ring onto a borrowed pair of glasses! Remove your watch and wave it counter-clockwise to reverse time until the watch vanishes from your fingertips and reappears on your wrist! Make an ungimmicked light-bulb from a string of Christmas lights flicker on in your hand, then go dark before you give it away as a souvenir! Instantly change places with someone you're standing beside on stage! And so much more! Ingenious card magic, eye-popping coin magic, adequate mental magic, plus tricks with matches, bills, balloons. BUT THAT'S NOT ALL! If you order in the next ten minutes, we'll also throw in TWO MORE TRICKS with notepads and bottle caps, PLUS a foreword by David Acer that will change the way you think about grammar! 190 pages in hardcover, written by David Acer, illustrated by Tony Dunn. 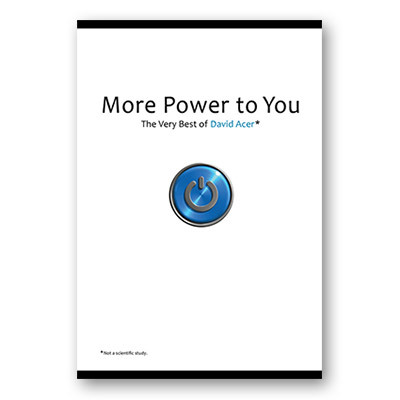 "More Power to you is a terrific collection of practical and novel tricks...For any magician looking to add a bit of whimsy or novelty to their repertoire, without sacrificing strong magical effect, this collection will give you a lot to think about, and might provide you with just the thing you're looking for. "